OMG, I finally made successful yeast bread...and what a great recipe to try this on! Although these are VERY time-consuming, as I'm sure most yeast breads are, I simply beamed with pride and amazement at the finished product. These are simple dinner rolls, but with a couple of unique additions: wheat beer and potato. I used a surprisingly nice Hefeweizen from Trader Joe's, and it really emphasized the yeasty flavor of the rolls and gave them a hint of sweetness. I think the potato just made the texture a bit denser, as I didn't really taste any "potato" flavor. The rolls are also perfectly salted and buttery, so you can imagine how wonderful these smelled during baking. The outside is crisp and crunchy, and the inside is soft, moist, and perfectly risen. Although I think my pre-bake "shaping" skills could have been a little better, the taste and texture of these rolls truly needed no improvement. Pair these with Beer-Cheddar Spread for an amazing snack. Milk was 110 degrees F. I used a candy thermometer for an accurate reading. "Warmed" milk as the recipe suggests really isn't saying much (for the novice baker). I really kneaded the dough for a whole 10 minutes. Set a timer. It's fun, and you'll get a bit of an arm workout! During kneading, I kept adding flour to the counter any time I felt the dough was getting sticky. This ended up being a lot of flour. To let the dough rise in a "warm place," I set my gas oven to 200 degrees F for about 5 minutes, then turned it off. I put the dough ball in a well greased bowl (and I also lightly greased the dough) and covered it with plastic wrap. It needed a full 2 hours for rising and the finger poke method (poke a finger in the dough; if the indentation stays, it's ready). Punching the dough down is fun! You'll need more flour when cutting and rolling/shaping the dough. This stuff was sticky. Make again? Probably not...and I ONLY say that because it is MUCH easier to just buy premade rolls from the store or bakery. 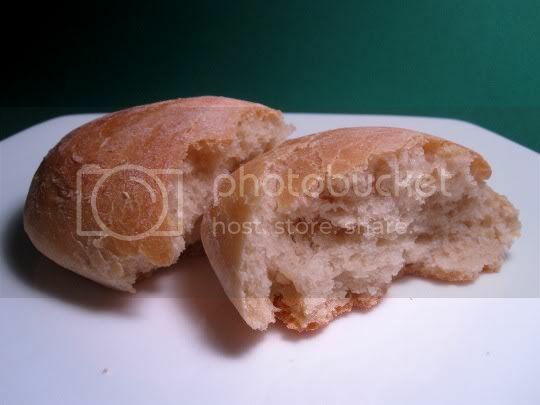 Don't get me wrong, these rolls are delicious...but who has the kind of time to make bread from scratch? Vegan variation: Use vegan butter and soy milk.